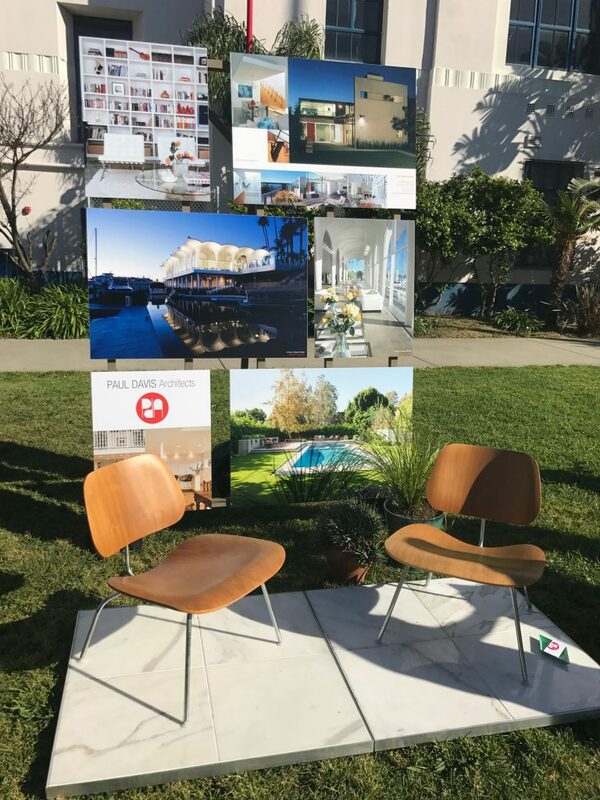 On Saturday May 20th, PDA was very pleased to participate in the “6th Annual Merchants of Venice Showcase”, a joint venture between the Venice and Mar Vista Chambers of Commerce. The Venice High School front lawn was a perfect location for the event, which featured dozens of local businesses and non-profits, displaying their wares and greeting the public (and each other) on a sunny and breezy spring day. PDA’s display (newly constructed for the event, and seen below before great throngs of guests arrived) featured a small-scale seating area for conversation, rather than the folding tables and chairs used elsewhere. Visitors were welcome to rest in Eames Lounge chairs on a Calacatta Gold marble-tiled floor while talking with firm principal Paul Davis. A range of our projects were represented on a large easel that defied the light wind due to robust construction by carpenter-at-large David Corcoran. 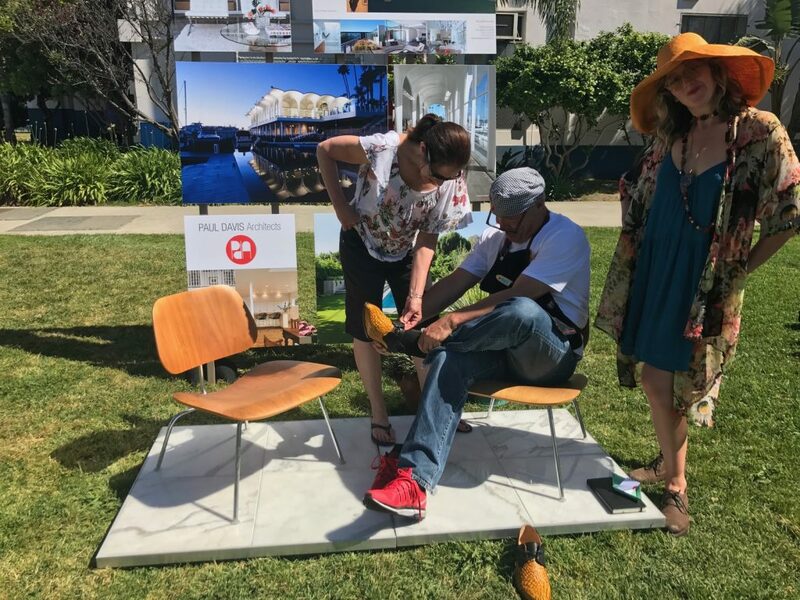 The PDA booth was positioned between Sausage King Jody Maroni and the vibrant shoe display set out by Petrea, founding manager of the Abbott Kinney John Fluevog shoe store. At one point, PDA loaned our “sales floor” to Jody and his girlfriend Joanne, who were considering some faux-alligator lace-ups that could only have been called ”snazzy”, while taking a brief break from serving extremely tasty sausages to all. It was a pleasure for PDA to meet and greet a range of local folks, including event organizer Donna Lasman, Venice Chamber president George Francesco, and Sarah Auerswald of the Mar Vista Chamber. We also enjoyed talking to Venice High student members of the Sports Medicine Team. We look forward to participating in future events, and are now well setup to appear, meet our neighbors, and share our work at short notice. Thanks to all those who put this fine event together!